This 5 minute fresh strawberry butter is a perfect recipe to take your everyday breakfast a notch higher. Make it while strawberries are in season and enjoy. Here is a step by step recipe of how to make Strawberry Butter at home using fresh strawberries. Morning toast with the same old butter can sometimes get boring, right? I am a breakfast person and Love to have a heavy filling breakfast which can sail me upto lunch time. On most days, it’s some form of egg with butter toast and sometimes if I get lucky, the house cook decides to surprise us with a Poha or rava idli. But I am always on a lookout for recipes that are super easy and quick to make and bring some cheer to the otherwise routine breakfast time. This 5 minute fresh strawberry butter solves the purpose just right. Just 5 minutes is all it’s takes from start to end to make it and it transforms the everyday butter toasts magically to something you keep craving for the entire day. 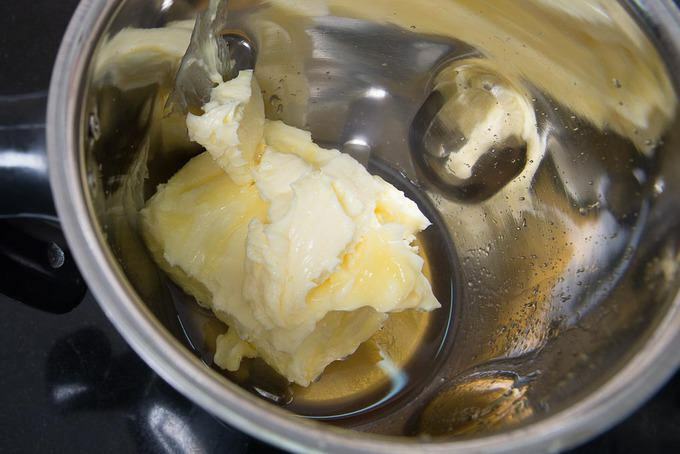 The butter taken a notch higher by blending it with fresh strawberries is Strawberry Butter. It has a nice sweet and tart taste from the fresh strawberries. It;s a very good idea to revamp your regular morning toast to something gourmet. How to make Strawberry Butter? To make this 5 minute fresh strawberry butter, just bring the butter to room temperature. 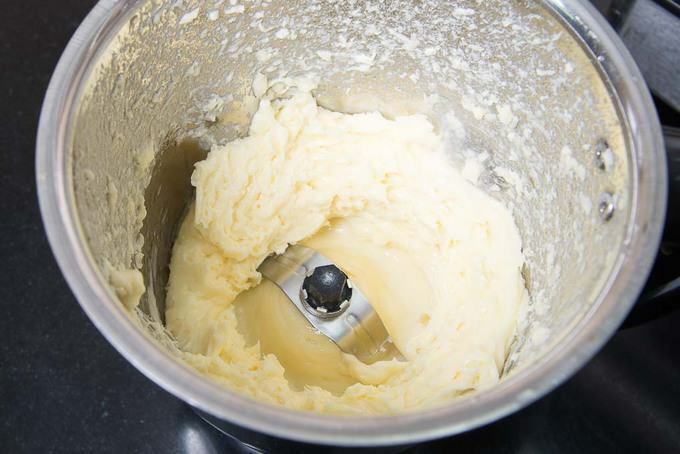 You can keep the butter on the counter overnight and it should be good to whisk. Blend it with honey and lemon juice until fluffy. 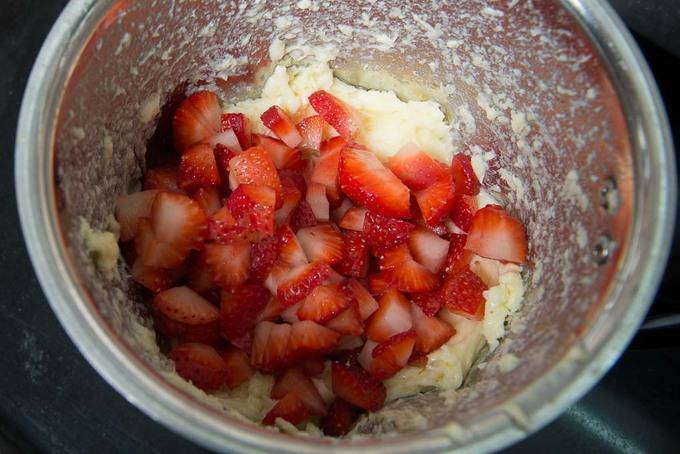 Chop strawberries and add them in the whisked butter and blend once again. And voila, it’s already done. You can also use powdered sugar in place of honey but honey makes it healthier and I like the taste better with honey. To make it a little fancier, you can make it into a log using plastic wrap and cut thin circles before serving. Can you freeze Strawberry Butter? 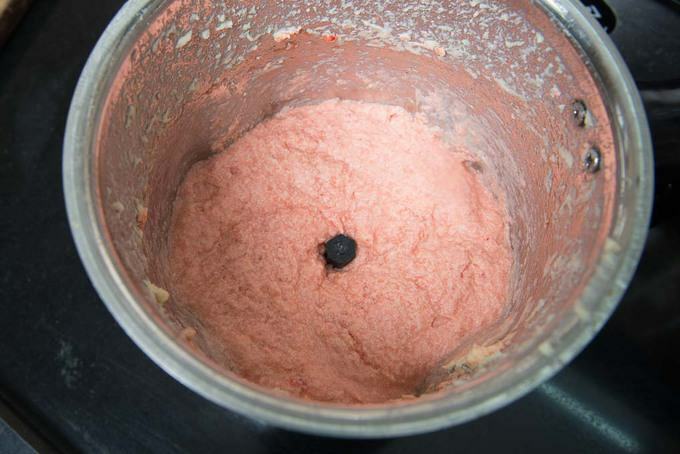 Strawberry Butter can be frozen for upto a month. You can freeze it in small portions and thaw one portion before use so that the rest of the butter keeps good for a longer time. How long does Strawberry Butter Last? In refrigerator, this butter will last for 3-4 days. But you can freeze it if you want it to last longer. So while the fresh strawberries are flodding the maket, get your a batch and churn out this 5 minute fresh strawberry butter. And then go ahead, toast bagels or sandwich bread, slather it with this fresh strawberry butter recipe and enjoy your breakfast. Also now that you have bought those pints of strawberries, do not forget to try this Easy Balsamic Strawberry Vinaigrette Recipe. Here is how to make it. Add butter, honey and lemon juice in the jar of a food processor and blend on high speed until light and fluffy. Add the strawberries and blend again until combined. Store in a glass jar and use as required. This 5 minute fresh strawberry butter is a perfect recipe to take your everyday breakfast a notch higher. Make it while strawberries are in season and enjoy. Add butter, honey and lemon juice in the jar of a food processor and beat on high speed until light and fluffy. Add the strawberries and beat again until combined.